•Look for “Manager” specials or clearance items. Stock up if it’s a good price for something you will use. •Use coupons if they apply to the exact item you will be buying. •Consider store brands and compare “Unit” Prices to get the best deal. •Try using less expensive cuts of meat in a slow cooker. It will save dinner prep time too. •Shop for fresh produce while it is in season to find a better deal. •Don’t take your children (and remember your spouse is usually your biggest child). •Utilize local cooperative food programs such as: Prairie Land Foods. •Consider having a potluck once a week with friends or neighbors. •Buy a programmable thermostat or at least make slight adjustments when you won’t be home. •Change your furnace filters at least every 3 months, if not every month. •Switch to compact fluorescent bulbs. •Turn down the thermostat on your water heater and flush it out yearly. •Reduce or eliminate extra features on cable TV, phones and Internet services. •Wash clothes with cold water. Line-dry your clothing inside. •If you use a dishwasher, then check your heat settings to see if it can be lowered. •Consider a level-pay plan with your utility companies. 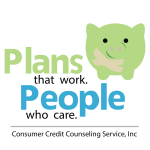 •Consider a pre-paid phone plan or consider a text plan versus a higher minute allowance. •Unplug items when you’re not using them, or you are still using electricity. •It is NOT better for your computer to be in hibernation mode rather than shut off. •Don’t buy a new vehicle. Try a used car with 36,000 miles or less. •Check the resale value of a vehicle before you buy. www.KBB.com or www.NADA.com. •Buy your vehicle at the end of the month; you can make a better deal. •Before you buy your next vehicle, research the insurance costs. And comparison shop your insurance. •A maximum of 20% of your net income for all vehicle expenses is what we recommend. •Keep your engine tuned up, change the oil every 3,000-5,000 miles and keep your tires inflated. •Use the lowest octane required to run your vehicle. •SLOW DOWN!! Aggressive driving can use 30% more gas. •Gasoline prices typically change on certain days of the week. Take that into consideration when filling up. •Car pool, take the bus, walk or ride a a bike; all great alternatives to using up the gas in your vehicle. •Turn off your vehicle if you’re going to be idle for longer than 30 seconds.